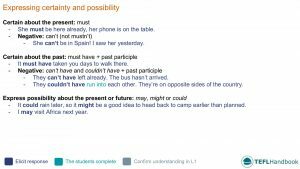 This ESL lesson plan contains activities, games and resources that teach upper-intermediate level students how to express certainty and possibility in English. If you use an iOS or Android device, you can get offline access to these materials through the TEFL Handbook app. 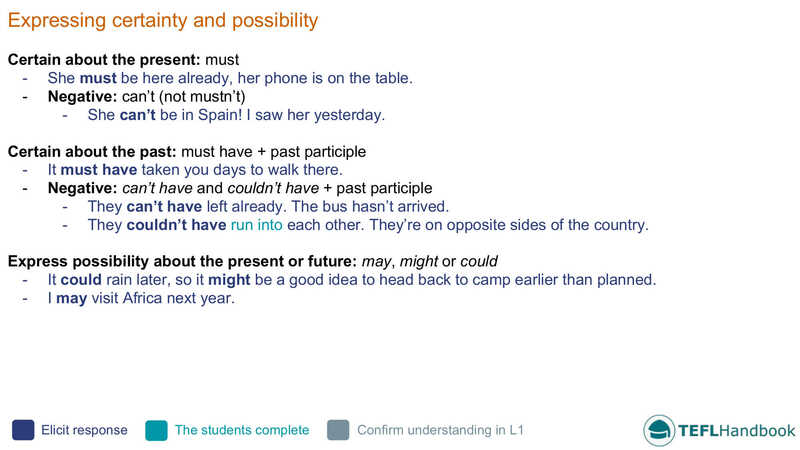 Explain each functional case and the use of modal verbs. Then, try to elicit examples of each from your students, adding the best ones to the board. Students have to create grammatically correct sentences related to travel, using modals of certainty and possibility. Start by adding the following prompts to the board. Learners at this level often confuse the meaning of some of these words, encourage them to use dictionaries or smartphones if they are available. When students are ready with their sentences, they should check them with a partner. Correct them together by eliciting a few examples of each, adding the best ones to the board. Students have to read and summarise an online article related to travel and tourism. Start by writing "The negative aspects of mass tourism" in the middle of the board so that it can form the basis of a spider diagram. Next, the students will work in groups of 3 or 4 to make a list of what they think some possible negative aspects could be. Allow 5 to 10 minutes for this, monitor their discussions and don't be afraid to join in. Have a group discussion at the end, building out the spider diagram with any new concepts and vocabulary. In teams, students will work through a list of travel-related expressions and try to compose definitions. Start by dividing the class into two teams. Tell your students that you are going to write a list of travel-themed expressions on the board and that they must write a definition for each one. When counting the scores at the end, the team with the best interpretation wins the point. 1. Live out of a suitcase: To stay very briefly in several places, with only the belongings in your case. 2. Leave a sinking ship: To stop involving yourself in a situation because failure is imminent. 3. Itchy feet: Feeling of a need to move or travel. 4. Miss the boat: To fail to take advantage of an opportunity. 5. Off the beaten track: Go to a place or places not commonly visited. 6. To sail through something: progress quickly and easily. 7. To hit the road: To leave a place. We hope that you found a few of these ideas useful. If you did, be sure to bookmark our complete list of upper-intermediate level ESL lesson plans, as well as our entire collection of ESL courses.